The war for talent is a term that was coined by Steven Hankin of McKinsey & Company in 1997 to refer to an increasingly competitive landscape for recruiting and retaining talent. Today, this “war” has escalated to new heights, commanding the attention of CEOs across all industries. According to research recently published by McKinsey, more than three-quarters of Fortune 500 CEOs do not believe their companies are effective at attracting highly talented people. Of those CEOs who do consider their companies successful at attracting top talent, only 7% believe they are effective in retaining them. In today’s hyperconnected labor market, recruitment and retention are not separate problems; they are two sides of the same coin. Companies that have adopted integrated strategies for recruitment and retention have a significant competitive advantage. But according to McKinsey’s data, this group represents only a small fraction of the Fortune 500. The rest of the HR universe is under tremendous pressure to become more effective at attracting employees who care more, work smarter and stay longer. 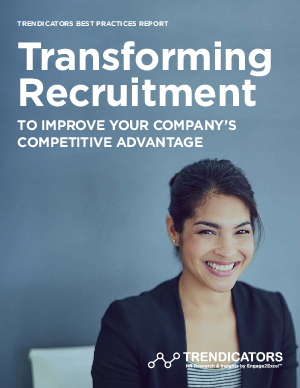 This eBook provides research and insight for HR executives who want to achieve incremental improvements in their recruitment strategy to increase competitive advantage.